My sons and I had decided to return to Washington, D.C., for Spring Break this year as it was our favorite past trip and we wanted to relive it. We resolved not to wreck the car on the way home this time. But then Saturday before we were to leave, the forecast called for solid rain all week everywhere east of the Mississippi. None of us wanted to walk the National Mall in the rain. 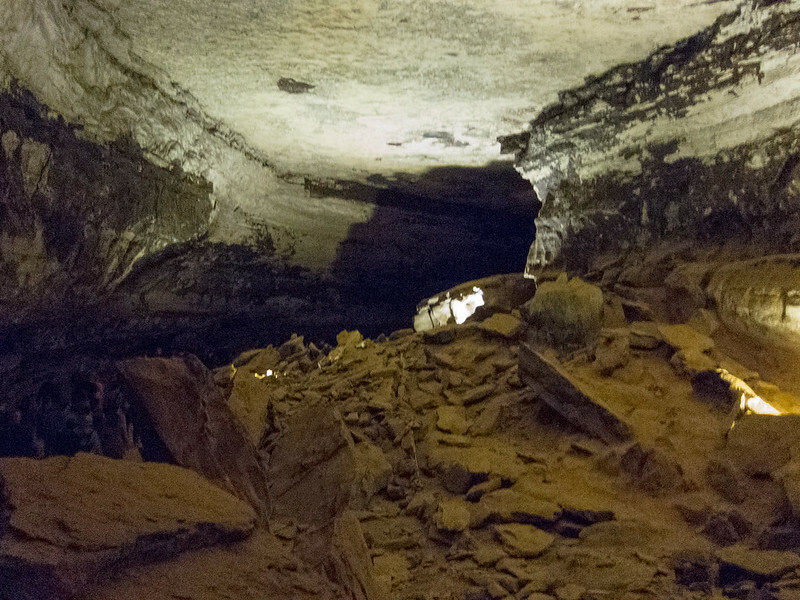 So we scuttled our D.C. plans and set our sights on Mammoth Cave. We first visited on the way home from our Tennessee trip four years ago. We couldn’t get a guided tour; those had to be booked in advance. So we vowed to return. This would be the year. Let it rain; we’d be dry underground. 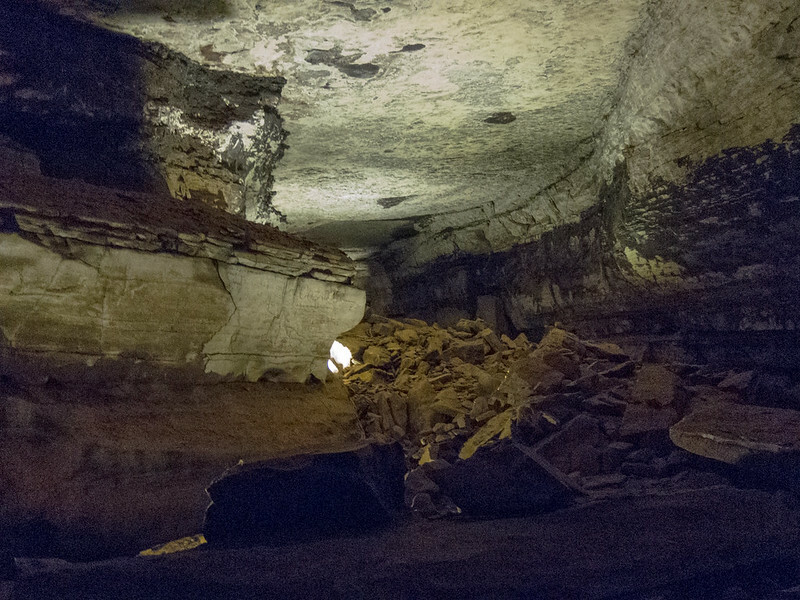 Caves have figured into our Spring Breaks before: Marengo Cave in 2007 and Meramec Caverns in 2013. 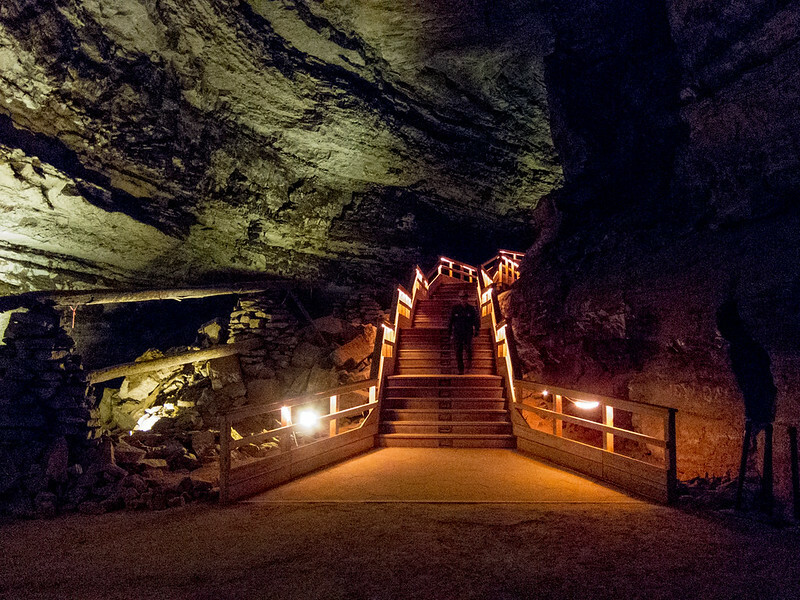 This is tourist caving — walkways guide the way, and stairs help you descend the depths. But where Marengo and Meramec were tourist attractions with all the attendant kitsch, Mammoth Cave is a national park with uniformed park rangers leading the tours. Not only is Mammoth the finest of these caves, but we learned something useful about caves from our guides. Our morning tour took us two miles in and 300 feet down. Behold, the power of water, eroding limestone for thousands of years. The ranger clarified that carbonic acid in the water did the work. That’s the same stuff that makes your soda fizzy, except it’s 500 times more powerful in your soda. Our second tour featured more than 500 steps down to reach this room. As you can see, we were part of a large tour group. The ranger told us that Spring Break is always crazy busy, but come back a month later and we would be in a group of maybe 20. Caves are naturally utterly dark. The park service strung lights throughout so we could see, but even then the light was challenging for photography. Tripods were prohibited. So I set my Canon PowerShot S95 to ISO 1600 and shot RAW so I’d have plenty of flexibility to make something of my photos. I shot probably 50 photos down there and these five are the only ones worth sharing. Even at such a high ISO, exposures were long and camera shake was a problem. Normally I come home elated (and tired) from a Spring Break trip, but even though we had a great time in the cave I couldn’t shake considerable sadness as we drove home. My older son graduates high school soon and heads off to college in the fall. I’ve loved our Spring Break vacations as a trio and will miss them. 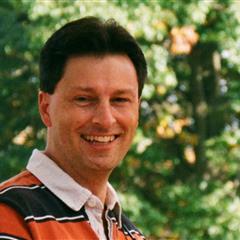 George, having watched my now 29-y-o stepson become the man he is, I know what’s in store and I’m looking forward to it! And I’m also looking forward to the empty nest, frankly; there are things I want to do when my direct parenting duties end. But I’m still sad to see my sons leave home. The teenage years are my favorite by far and it’s hard to watch them end. Last paragraph a summary of life’s events. Everything comes to an end, often accompanied by sadness. But soon enough new adventures fill the voids and we make new memories. I’ve had no trouble at all with the childhood passages up to now. But the prospect of not seeing my sons regularly as they begin their adult lives — wow, that’s hard. But like I said to George above, I’m simultaneously looking forward to the empty nest, as there are things I want to do that I just don’t have time for as I finish raising my sons. This is the biggest thing I’ve done on two feet since my foot surgery last year. My foot hurt a little bit when it was all over. But at least I could do it! Thanks! We love caving too. Sounds like a great spring break. 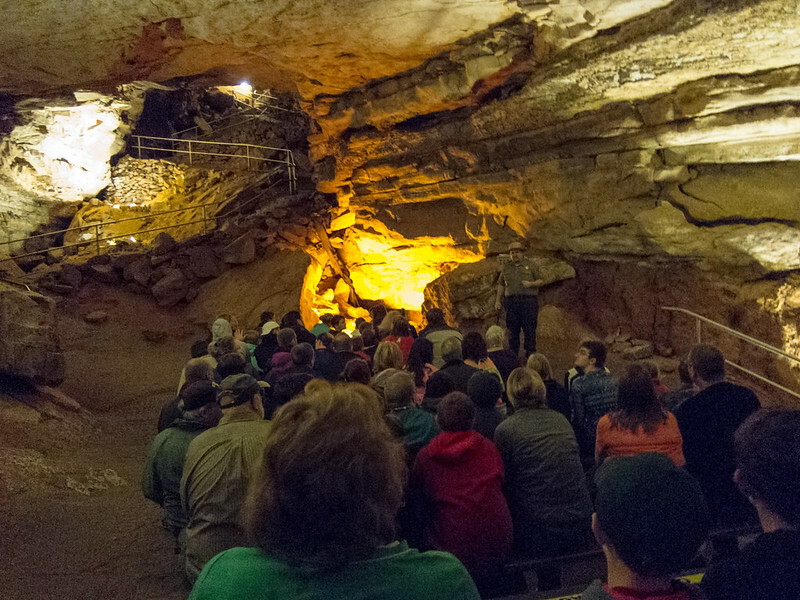 We hope to visit M. Cave this fall. 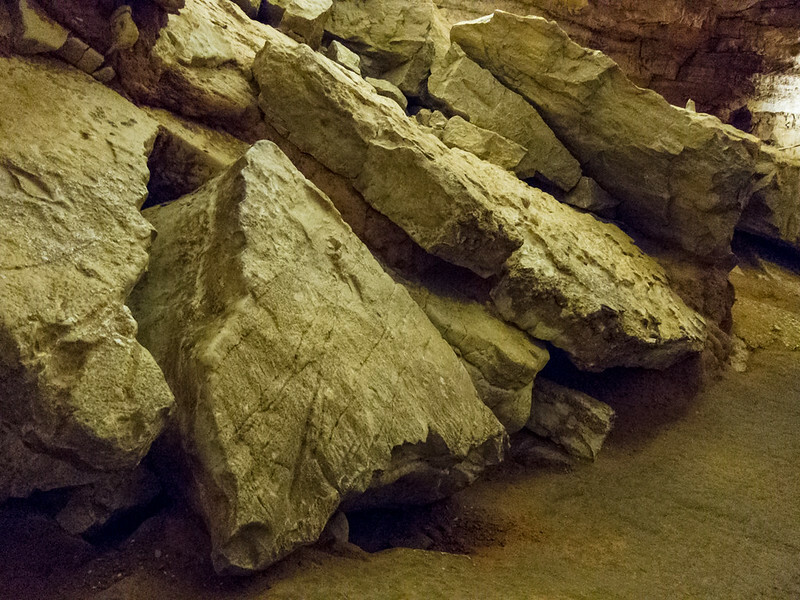 I usually use my Nikon D7000 on auto ISO set to stop at 6400 in caves. I usually don’t set my S95 over ISO 200 as I don’t like the noise in the photos, but yours look pretty good. I shot RAW and tweaked these in Photoshop to get them to look this good. I find noise on my S95 isn’t a huge problem until you get past ISO 400, after which it’s pronounced. But RAW processing and a little automatic noise removal helped these shots tremendously.